Another soup I'm afraid. I recently spent 10 days in the South of France and gorged myself on delicious cheeses, heavenly olives and incredible artisan bread. I drank many, many glasses of extremely delicious wines (and was propositioned by one of the growers at my favourite vineyard). The uptake of living la belle vie was upon returning back to London, I hopped on the scales and discovered that I had paid the price of my excesses in the form of a small spare tyre. So a little reigning in is required, both financially and in ensuring that all my clothes continue to fit. The best way for me to do that is to eat soup, and lots of it. So here is another recipe. Sweet potato and butternut go extremely well together, being similar tasting vegetables from very different families. I fancied a soup with a little more of a kick than my usual butternut squash soup so decided to go for a more aromatic approach, with ginger, chillies, cumin and coriander. The end result is lovely - a warming, rustic soup with a gentle kick to it. Enjoy! Switch the oven to 180°C. While it is heating up, peel and shop the sweet potato into large chunks, then place in a large bowl. Do the same for the butternut, taking care to also remove the seeds. Add to the bowl, then pour in 1 tbsp olive oil, the cumin and coriander and a little salt and pepper, then toss until the sweet potato and butternut chunks are lightly coated in olive oil and spices. Place in the oven for 40-45 minutes, turning occasionally until soft. While the butternut and sweet potato are roasting, chop the onion and peel and slice the ginger into matchsticks. Fry them both using a in a little oil until soft, then slice the chilli and garlic. Add to the frying pan and cook for a couple of minutes then turn off the heat. Once the vegetables have finished roasting, add them to the pan with the onions, chilli and ginger along with the stock. Simmer for about 20 minutes, then in batches blend the soup until smooth. I pushed it through a sieve to make it a little smoother still, but it's up to you if you want to do it or not. Heat through until piping hot and serve - I stirred a little natural yogurt in at the end to give it a little creaminess, but I'll leave that up to you. I love butternut squash and sweet potato soup. I was also in France a few weeks ago and ate far too many cakes! France does that to you! 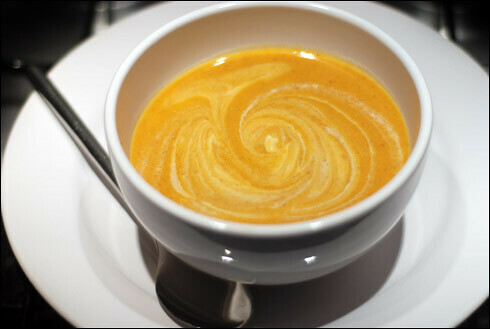 Very nice flavor combinations and beautiful to look at soup! It looks so delicious.I like it very much,thank you for your service and I am satisfied with it.